Since I had to replace the headliner, I decided to do it right and remove the front & rear glass. This didn't appear to be difficult at first but like most other things, it took time. I decided to replace the front and rear window gaskets to removing the glass was not difficult. 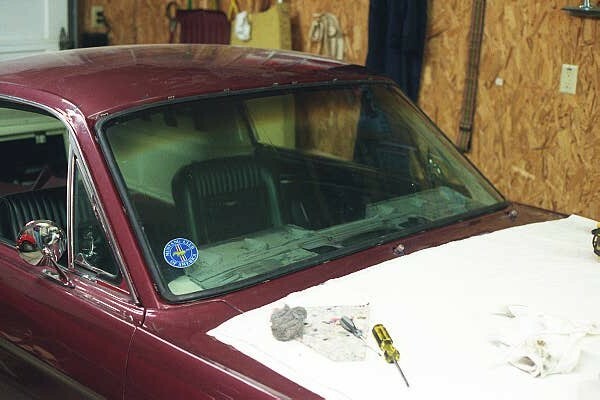 The windshield was an LOF replacement glass while the rear backlite is the date coded original Carlite. It turns out that both glasses (?) had been removed to put the black headliner in as the headliner looped over the pinch weld flange into both window cavities. Whoever did the black headliner did it right! Here we have yours truly cutting away at the windshield gasket. It you are inexperienced, this is the safest way to remove the glass. Simply cut the flap of gasket that retains the glass with a razor knife and then slowly push the glass off the car. Here's another reason why I cut the gasket to remove the glass - age. This windshield has been in the car since 1982 when it was last inspected. This is when the previous owner to the guy I bought the car from bought it. Nineteen years and the rubber gets stiff and brittle so it's best to replace it. This is a no-no! What can happen here is the windshield break in half due to the weight of the cantilevered halves. The glass should be leaned up against something with the outside face (convex) side out, or flipped over and supported in at least two places on the inside (concave) surface. Same goes for the rear glass. Fortunately, I was lucky and didn't have to claim the doofus award. Front end is all prepped and ready to accept glass. Note the edge of the new headliner glued in place on the window flange. Note the moulding clips are all installed. If you forget to do this and install the glass, it is very difficult to put the clips in properly. Glass installed and ready for mouldings. Putting the glass in is a two-person job. One person pulls the rope to bring the gasket inside the flange while the other follows the rope pushing down on the glass to ensure the gasket seats properly. I didn't document removal or installation of the rear glass. 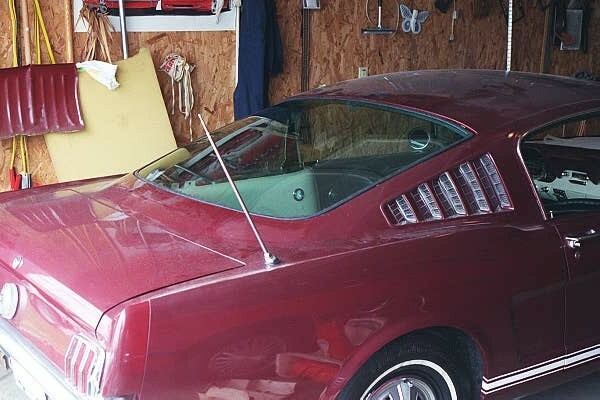 However, the procedure is the same as for the windshield. This was the first piece of glass to go back into the car. 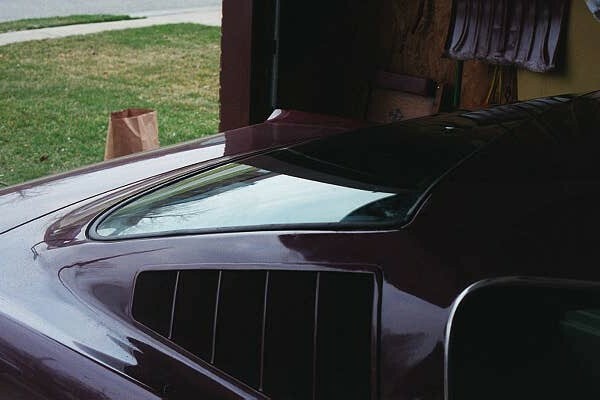 The only difficulty with the rear window was at the upper right and left corners. These are 90 degree corners and very difficult (for me, anyway) to pull the inside gasket flange over the pinchweld flange. 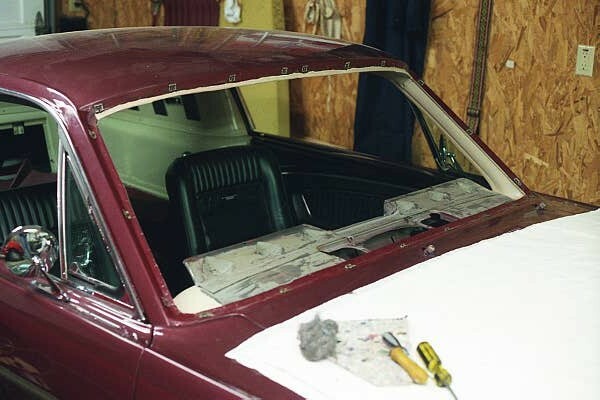 Plus the fact that I knew there is no replacement for these 65-66 fastback rear glass made me nervous. I pulled the rope inside the car while my wife followed pressing on the glass to seat the gasket. Another shot of the rear glass installed. Reinstalling the moulding was a bear as the new window gasket was ever-so-slightly thicker than the old gasket, plus my moulding pieces are fairly battle scarred. Eventually, they will be replaced. Here too, don't forget to install the moulding clips before the glass.